* Sealing Nut, Locknut & Body: Nickel-plated Brass (available in Stainless Steel). 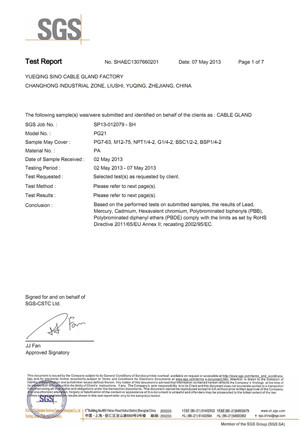 * Clamping Claw: UL-recognized Polyamide 66, 94V-2 (contact us for V-0). 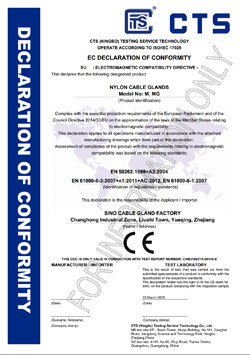 * Seal & O-ring: oil-resistant NBR (also available in weather resistant EPDM, Natural Rubber & Silicone rubber). 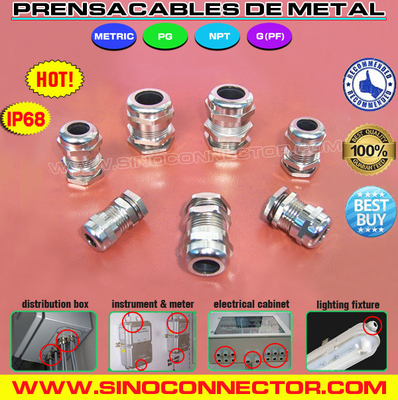 With high impact resistance, wide clamping range, optimum strain relief, high sealing performance & high security and stability, Prensacables o Prensaestopas de metal (latón niquelado / acero inoxidable) con roscas PG, Metrica y NPT are widely applied in the fields of electrical and electronic technologies, telecommunications, wireless networking ODUs, automatic control, power supplies, switches, motors, distribution boxes, solar PV modules, Inverters, lightings, displays, traffics, signals, surveillance cameras, plant engineerings, machineries, meters and instruments, etc. * M8, M12, M14, M16, M18, M20, M22, M24, M25, M27, M30, M32, M36, M37, M40, M42, M47, M48, M50, M54, M56, M60, M63, M72, M75, M76, M80, M88, M90, M100, M110, M120, M125, M150. 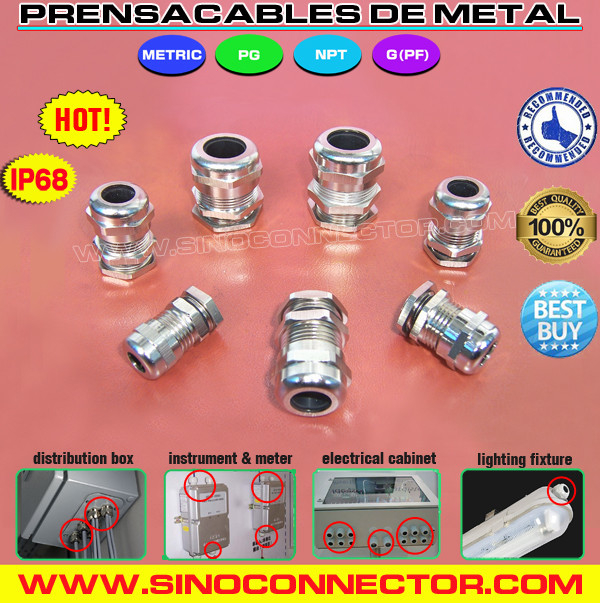 * NPT3 / 8", NPT1 / 2", NPT3 / 4", NPT1", NPT1-1/4", NPT1-1/2", NPT2".